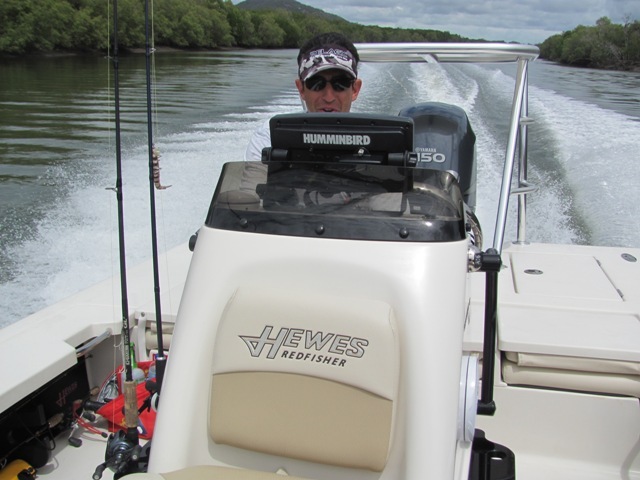 We'll they just keep coming - Another mate has pulled the trigger on a pre-loved Hewes Redfisher 18 from the USA and he just happens to be based in our town of Townsville in North Queensland. After coming for runs in mine and Ramcon's rigs he started looking and came across an awesome rig. I just so happened to be at Bohle Cold Rooms inspecting a new purchase when a transport truck pulls up at the big Marine Shop across the road and here I am stunned to see Stav's 18 RF up on top. I give him a quick call as I see the guys unloading and he shoots over to see his new baby just as it gets lowered to the ground safe and sound after a m***ive journey. 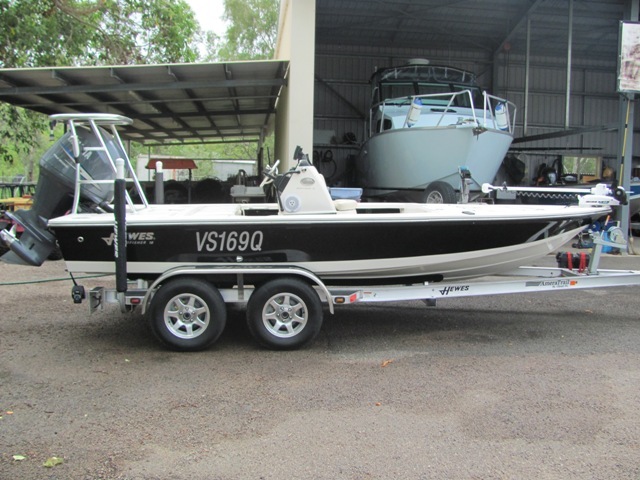 After a clean up, some sorting out I got a call to come for a run and I can tell you I was excited as this is the newer model which I was dying to see the differences, how it rides and how it fishes. I love this model with the split seats, new console and it appears more beefed up then my 2005 model. Can I tell you there is nothing like a new owners smile when they drive these rigs (see bottom photo). We caught a few fish had a ball for the morning and on the way home we pulled into Parkesy's place (bonefisher 16) to wash her down and have a cold one and show off the great rig to him. Just for the record Stav got 45 knots out of her down the creek on a long stretch we had to ourselves which was just awesome and I couldn't believe the way this 18 pulled the water back with the trim tabs to get quickly to minimum amount of hull in the water with a sweet note coming from the F150 - it is set up beautifully. Here it is after a quick tub at Parkesy's place and it looks nothing short of awesome and Stav has had it out on multiple times in the last couple of weeks and is super impressed and loves it already. I won't get into any of the details and goodies on her but just wanted to welcome him on-board to the Hewes Family Club Down Under and I am sure he will be adding stories from her for all of you to read in the near future. 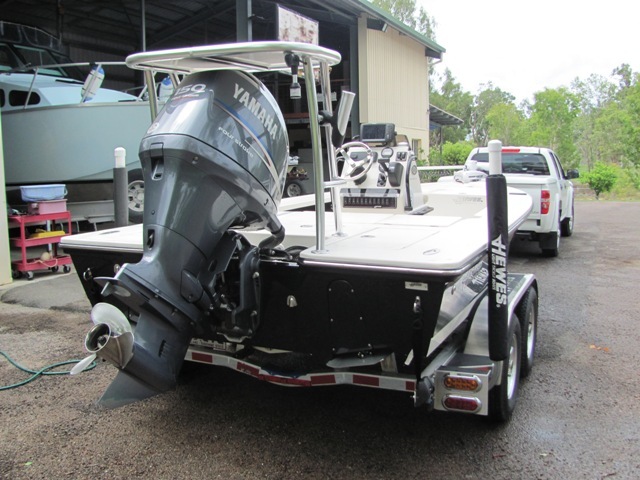 Look out for this one on the water guys. Could i get an idea on what he paid for it and the cost involved in getting it here. Thanks for the pics Waz. She is performing so well. Very impressed. Mick flick me a email on sbogiatzis@hotmail.com and I will give you more details. 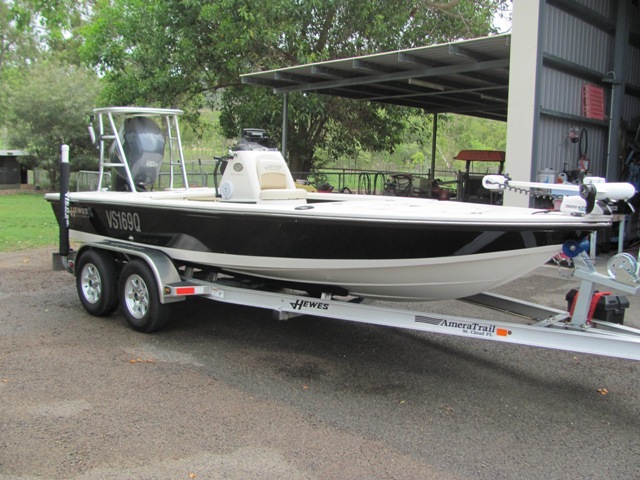 Love this boat, and I think you're in love with her as well Stav. Need an MBC boat day soon I think.